James Mattis is carrying a monstrous political weight on his shoulders. He's the man — alongside Secretary of State Rex Tillerson — whom America's treaty allies are looking toward to steer Trump's foreign policy in more conventional and reassuring directions. Over the past week alone, Trump unsettled the following allies: Australia, Germany, and Mexico. And he's withdrawn from the Trans-Pacific Partnership, leaving China to become a more dominant trade player in Asia. And China-watchers are worried about Steve Bannon's hawkish views on the South China Sea. In short: America's treaty allies are questioning whether Pax Americana is stable in the Trump Era. 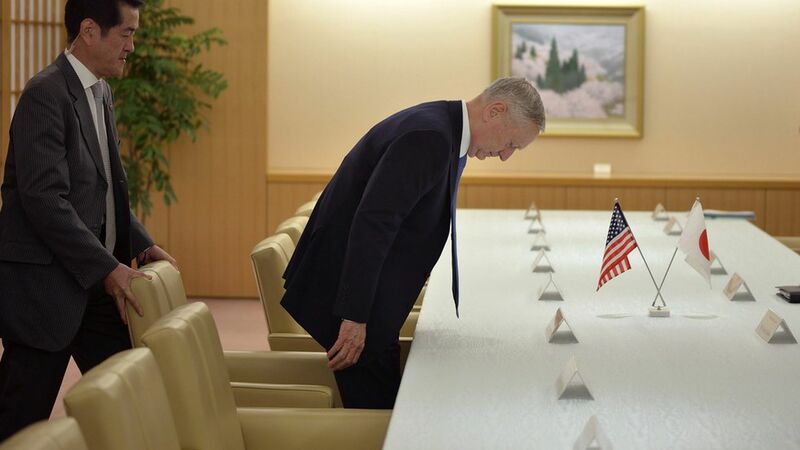 Enter Mattis. He's well respected on both sides of the aisle, and seen as a moderating influence on Trump. Outgoing Obama Administration officials love him. He traveled first to South Korea and Japan to deliver a clarion message of American support. Why this matters: Trump thrives on instability. Applied to foreign affairs, however, Trump's bombast has unsettled every country that lives under the U.S. security umbrella. Mattis and Secretary of State Rex Tillerson are the best hopes these countries have to stabilize Trump. The earliest signs since their appointments — Mattis' Asia trip and Trump's unexpectedly conventional statement on Israeli settlements — may make America's allies cautiously hopeful.